We got through the responsibility stuff. We added protection and practical functionality to the F-150, the modding equivalent of a 7-year-old cleaning his bedroom. It’s not very fun, but you feel better after doing it. NOW, however, we can have fun. Now we can talk about horsepower, torque, and lift. Here are our favorite performance modifying Ford truck parts for the 2015 F-150. Remember all those awesome lights we added a few weeks ago? They need power to shine. When your truck is running, it’s generating more then enough electricity to make that happen. But at some point, you’ll want to shut that engine down and still want to use the lights. Or your radio, or a winch, or a smartphone charger, or other Ford F-150 accessories. Your stock battery, and most car batteries on the market, are what’s known as starting batteries. This means that they’re only designed to power the vehicle’s electric starter. This requires a fully-charged battery, but only skims the top of the battery’s reserves. The battery is designed to only be discharged a little whenever it’s used. Discharge it all the way, every time you use it, and you’ll be hosed. The battery will stop holding a charge. What you need is a deep cycle battery. This is a battery that’s formulated to be deeply discharged often and will still start your truck, recharge, and hold a charge just fine. 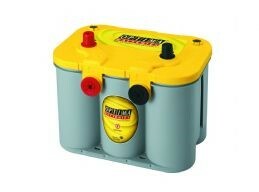 And the best deep-cycle battery on the market is Optima’s amazing Yellow Top. Optima batteries are considerably different from your average car battery. Where most use lead wafers bathed in acid, Optima batteries contain no liquid at all, instead using Absorbed Glass Mat, or AGM. Since AGM has no liquid, it remains far more stable at very high or very low temperatures and more resistant to vibration. AGM batteries also tend to last far longer than most, with an average operational lifespan of ten years. So with the Yellow top, you’re not only getting a deep-cycle battery, you’re getting one that will likely last a decade. Now, on to the parts that make your truck faster. Don’t you wish there was just some button you could push to get more horsepower and torque? If you guessed that we’re going to tell you there is, you’ve seen alot of commercials, and you’re right. Because there is: the Diablosport InTune. 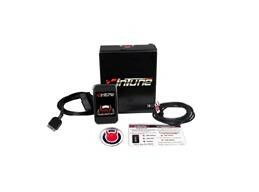 It’s a tiny module that plugs into your OBDII port (just under the steering column) and grants you a colossal 40 hp and 70 lb-ft of torque. Here’s how this works: Your F-150 has a computer, an ECU, which determines how much fuel the injectors spray into your engine. When you push the accelerator further, it sprays more fuel, and when you let up, it sprays less. The InTune changes these parameters in the ECU, so that when you put your foot down, it sprays even more fuel, increasing your power. This is a simplification, as it changes other things about your ECU, as well, to make it all work, but all you need to do is plug it in and follow the instructions on the color screen. “Hang on,” you’re thinking, “Won’t this void my warranty?” The InTune saves your factory settings so you can just switch back over whenever you take your truck in for service. It has other features, too. A screen you can plug into the OBDII port can be massively useful. You can read and clear any trouble codes the engine is throwing. You can log all the data you need and you can even add custom tunes. It has full PC connectivity, too, so you can download the latest updates from Diablosport. With all that functionality and an easy 40 hp, why not? Your F-150 has a 3.5 V6 from Ford. It’s not a V8, but that doesn’t mean it can’t sound awesome. Ford chose a turbo V6 for their new GT, after all, and it sounds plenty awesome. So why does the GT sound like a titan clearing its throat while your truck sounds like a box fan? The exhaust. The GT’s exhaust is designed to give it an aggressive, supercar growl. The F-150’s is designed to make everybody happy, even 90-year-old librarians. So it remains as quiet as possible. But you’d much rather have something closer to the GT’s sound, and who could blame you? If it can sound better, why not make it sound better? You could just lop off the mufflers, but though that would be loud, it wouldn’t create a good sound. Instead you’d getdrone, a bunch of annoying overtones. And if you live in California, you’d probably be arrested. Flowmaster engineers their exhaust systems specifically to eliminate drone and promote an angry, bellicose exhaust tone. To produce this sound, they open up avenues for sound and exhaust gasses. 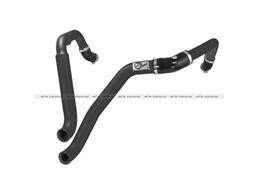 This reduces resistance in the exhaust system. Your engine doesn’t have to work as hard pushing those gasses through the exhaust, which means it can send more power to the wheels. That’s right. You signed up for an awesome sound, and you got more power and torque thrown in, making an exhaust one of the best F-150 upgrades you can get. By itself, this system has been shown to add an extra 8 hp. Paired with the InTune, it will likely see even more. 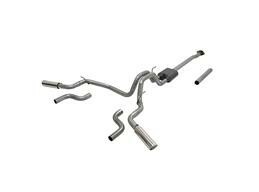 This is a cat-back system, which means you bold it on right after your catalytic converter, and it’s custom fit for the F-150 so your current exhaust hangers and junctions hook up to the right locations. There’s no welding required. The great thing about driving a truck is that no one looks at you funny when you lift it. You can lift a truck all day with no backlash, but the MOMENT you try lifting a Ford Festiva, you lose all respect! Anyway, lifting your F-150 has a ton of advantages, both practically and aesthetically. Practically, it gives you a better view, increases your off-road capability, and allows you to fit bigger tires. Aesthetically, it allows to to fit bigger tires. Yeah, bigger tires look awesome. With this lift, you can mount tires up to 35.” The kit itself even looks great. 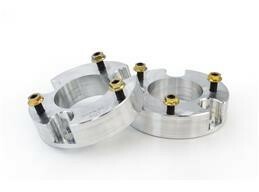 The extensions are made of CNC machined billet aluminum. The kit is remarkably simple. It uses a pair of strut spacers mounted up front. Since the front half of a truck is always the heaviest, if you lift the front, the back generally follows. Simply remove your struts and top hats, bolt the spacers to the top hats, and then put everything back in place. The setup is solid, stable, and safe, and you get an attractive, functional lift. Like your exhaust, your intake makes noise. Lame people don’t like noise. So Ford designed the stock intake to deaden that sound. This, by necessity, slows and warms the air going into the engine. Just as with fuel, your engine needs air. The more air it gets, the more power it can make, as long as the fuel can keep up. (This is where the InTune comes into play, and why a programmer and an intake work best together.) Colder air can also help with power. Hot air expands, while cold air is denser, which means there’s more oxygen within a given volume of air. The more oxygen headed into your engine, the more power it can make with the air it’s given. AFE CAIs are designed to get the most and the coldest air into your engine as possible. Their intakes improve flow with an uninterrupted, streamlined path for the air. The other key is their filters. The included filters are oiled units, rather than paper or synthetic. This allows the most air through while still catching the finest particles. You don’t have to mess with it for 100,000 miles, when it finally gets too dirty. Then, once it is, you don’t have to throw it away and buy another. You can simply wash it, apply new oil, and toss it back onto the intake for the next 100,000. There are no downsides here. Yes, you may hear an intake sound, but it’s an awesome sound, anyway. Hearing the sound is another improvement over the boring, stock intake. Now that we know what we do about cool, dense air, it’s time to talk about the turbos. Turbochargers, you probably know, are powered by hot exhaust gasses moving through a turbine. The turbine spins and compresses more air into the engine. Remember, more air=more power. This is the basic principal behind the turbo. But remember as well that hot air isn’t nearly as effective as cold air. As the air comes into such close proximity to the hot exhaust gasses, it heats up. This is why it then passes through an intercooler on the way to the throttle body. 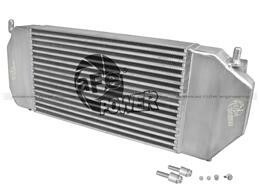 An intercooler acts as an air-to-air radiator of sorts to cool the air as it passes through. The stock Ford intercooler is okay, but many EcoBoost owners have found that it hampers performance, not efficiently cooling air as it passes through. 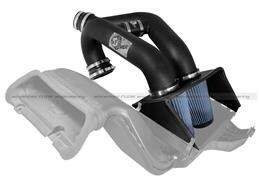 AFE will take care of that with their aluminum BladeRunner intercooler. Larger than the stock intercooler, the BladeRunner is able to provide more surface area for heat dissipation. It also uses a bar-and-fin design, rather than the stock tube-and-fin design of the stock unit. This means more cooling and more power. End tanks are TIG-welded for durability, and the hose fittings are billet, CNC machined for a perfect fit. The BladeRunner even includes a drain for any condensation that may build up within the unit, as well as a 1/8″ NPT fitting. It’s rated up to 200 psi. An upgraded intercooler calls for upgraded ducting, but AFE has you covered there, too. This hot-side ducting kit is constructed of 2″ to 2.5,” mandrel-bent, black powder-coated stainless steel tubing for a 16″ increase in flow over the stock duct, as well as better heat dissipation. 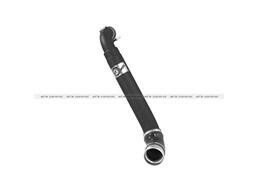 The cold side tube is made of 3.5″ to 3″ stainless, also mandrel-bent, and also powder-coated wrinkle black. This tube increases flow over stock by 15%. Both tubes include all premium clamps and silicone couplings, and both attach to factory mounting locations. These easy upgrades can give your F-150 a serious performance advantage over the others on the road. Remember, these 2015 F-150 performance parts are specifically for an EcoBoost Supercrew 4×4 with a 5.5′ bed. If your truck varies from this, you may need different parts. We probably have them, but we want to make sure you’re getting the right stuff, so if you’re not sure, drop your question in the comments section below, or give us a call at 877.787.8989 and our helpful, American techs will help you figure out what you need. What are your favorite Ford F-150 performance parts?